As the snow thaws and the warmth comes up, the spring season is right there on our doorstep. We all love the spring season. And the best part of the spring season for the kids is easter. 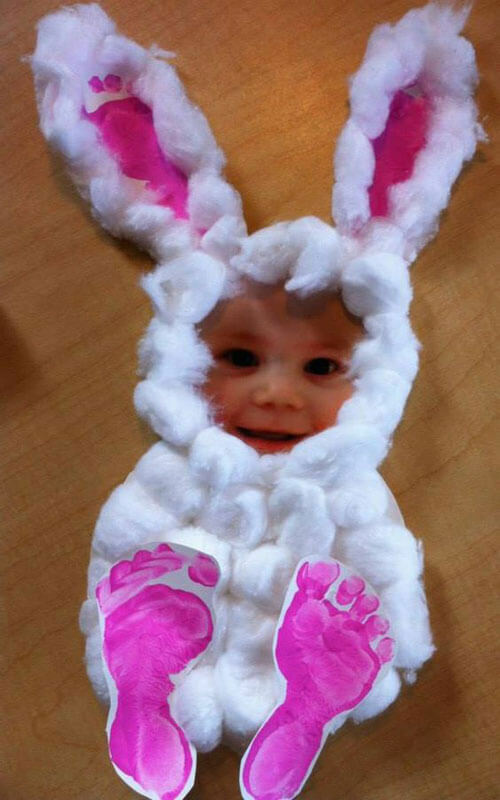 Easter is one of those festivals which brings a smile to every member of the household. It is the most frolicsome day of the year. The weather is the best and the festivities are also conducive to each age group. 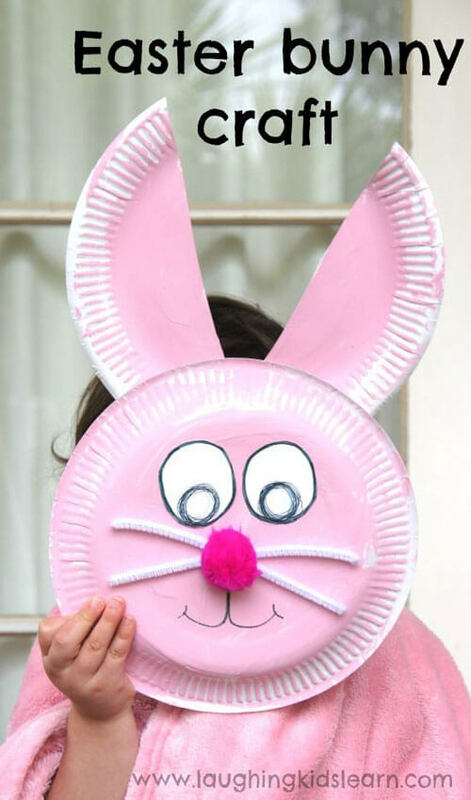 So let us start with some easy to make craft DIYs for your children and their friends to have fun on this Easter. 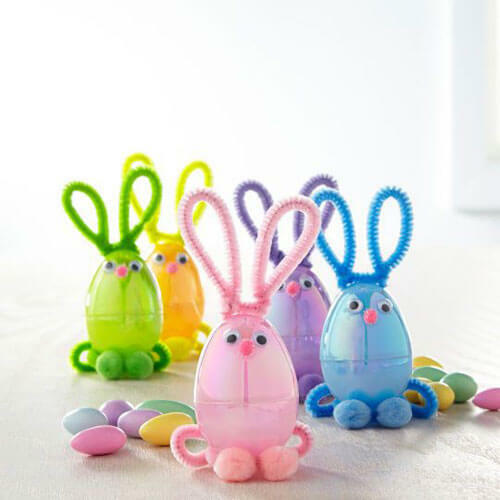 These are very cute looking bunnies and very much suitable for the Easter. 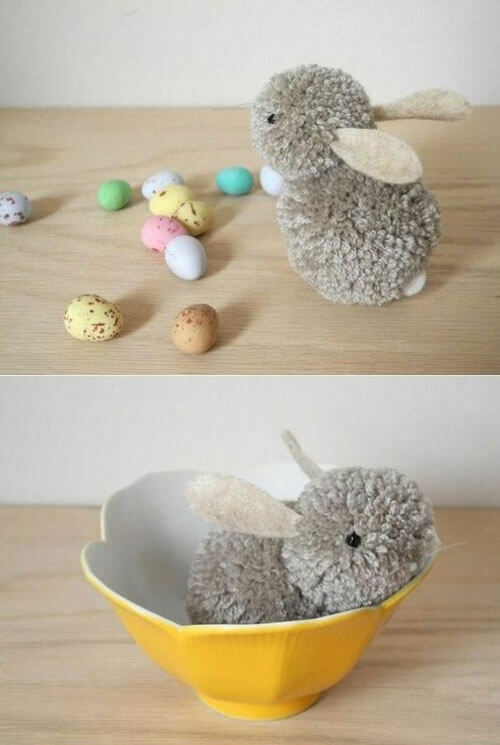 The plastic egg shells are used to make these bunnies. 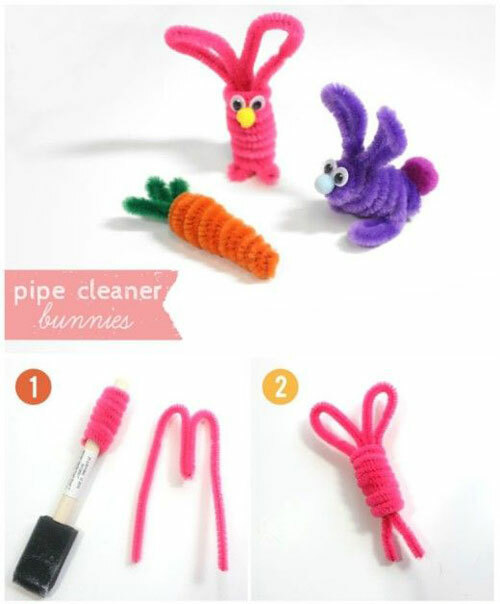 Get some pipe cleaner to make the ears and legs of the bunnies. Add some googly eyes. A pom pom nose is a must for the cute bunnies. Do not forget to add the pom pom feet to the cute little bunny. You can hide small treats inside these plastic egg containers. Easters is all about bunnies and bunnies love cartots. Make these carrot foorprints a game for your kids. Get them to stomp with orange paint on their feet on a white sheet of paper. Cut the foot prints with a paper scissor. 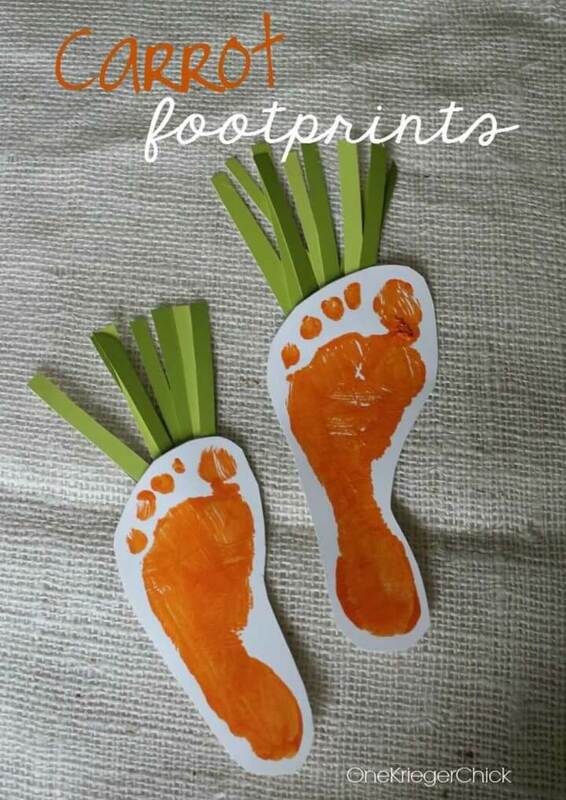 Now add green coloured paper slits to the top and your footprint cartots are ready to go. If you have a toddler then only get the toddler to make footprints. 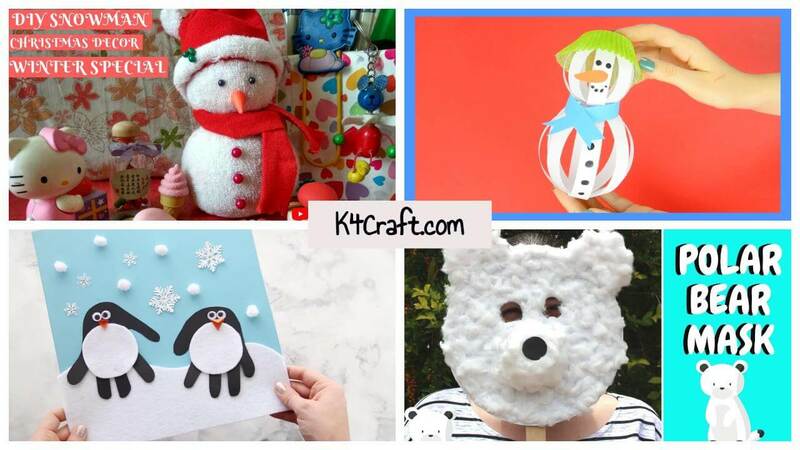 If your child is a bit older, he or she can also do the cutting and the pasting work. These are cute little bunnies. First of all make your kid dip his or her hand in white paint and get an imprint on the sheet. Do not get an imprint of the thumb. Now fill the outer two pairs of fingers with pink paint. Draw the eyes, nose and mouth of the bunny. Now your kid’s creativity is out for display. You can even play this as a game. This is a fun activity for your toddler. First of all get the template for a bunny and print it. Cut the shape out. Now add the eyes and ears to the template. Now keep a piece of coffee filter in between the paws and the mouth. Glue the whole setup together. 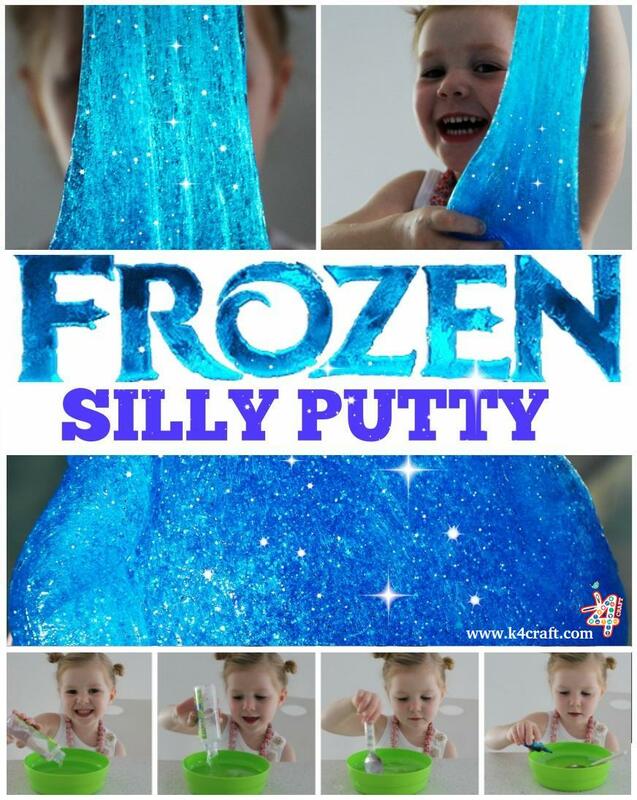 Now let your toddler make volourful spots on the coffee filter. 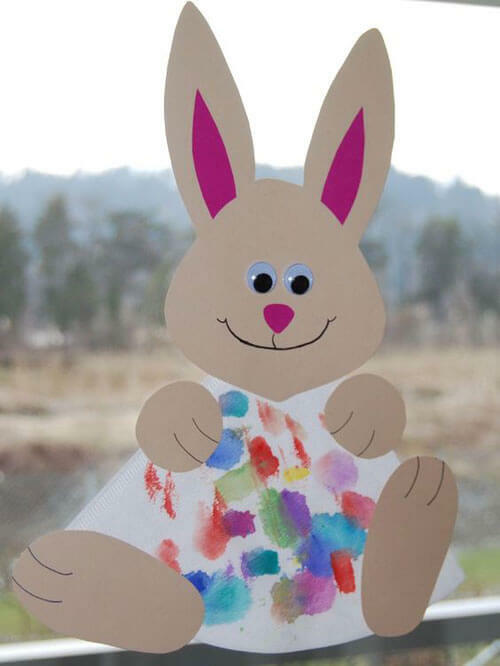 This cute little bunny will surely be a playmate for your kids throughout the Easter. Make two grey or pink pom poms. Now sew them together. Stick on two black button eyes on the mouth of the bunny. Cut out two ears for the bunny in felt cloth. Sew the ears onto the bunny. Your bunny is complete. Now your kids can have fun with the bunny. This is a very easy way to engage your children this Easter holidays. You can make cards or showpieces using this technique. First of all make your child dab his thumb in colour and get an imprint of the coloured thumb on the final sheet. After the imprint dries, make the legs, eyes and ears of the bunnies or chicks. Write Happy Easter on the top. This finishes off a very thoughtful Easter card or showpiece. Take two paper plates. Paint them in pink. Now cut one of the plates in half. Take the complete plate and stick eyes onto it. Draw the mouth of the bunny on the plate. 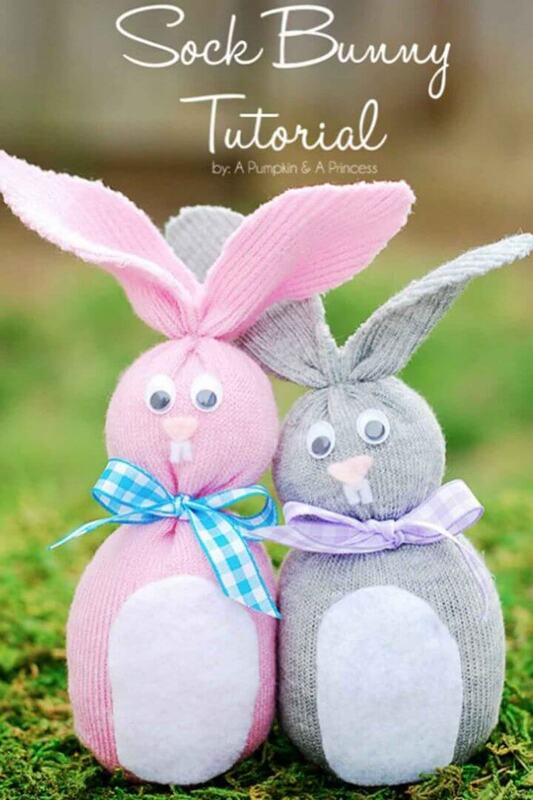 Use a pipe cleaner to make whiskers and a pom pom to make the nose for the bunny. Once you are done with this use the half cut plate to make the ears of the bunny. First of all get some plastic eggs. 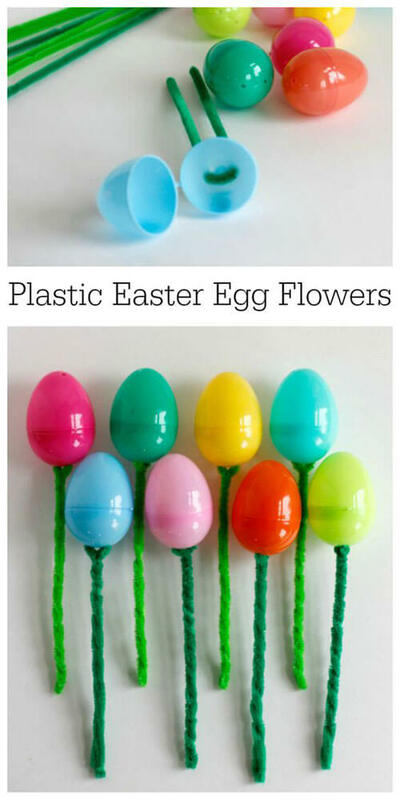 Now tgread a pipe cleaner through the bottom of the plastic egg. Now entwine the pipe cleaner onto the two sides of its own. Thus you get beautiful Easter egg flowers. 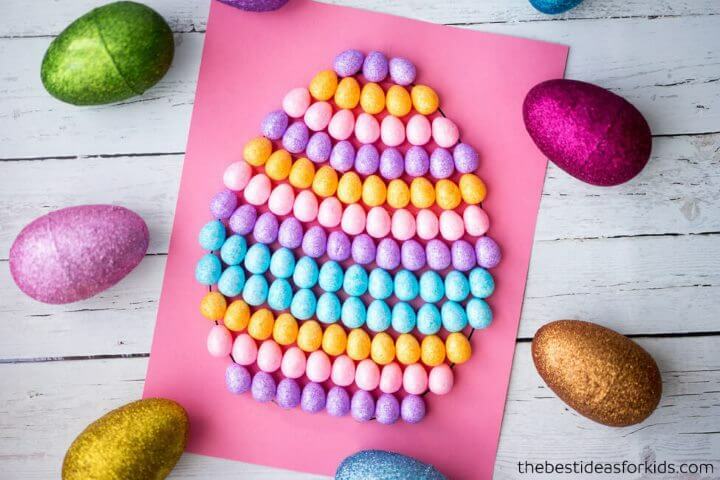 You can hide small treats inside these plastic eggs. This is an easy way to decorate your house with the help of your children. Get some crafty scissors and coloured paper. Now cut strips of the required length. Now form grass with the help of the green strips and make the carrot with the help of the orange strips. Sew them onto a thread or rhin rope. This is a very easy painting fun. First of all let your child hand print the sheet with different colours. 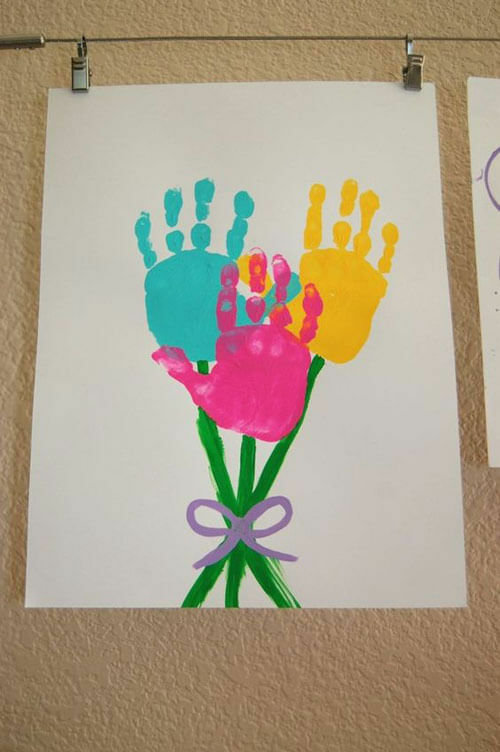 Now ask them to draw the stalks of these colourful flowers. In the end draw a ribnon at the bottom of the stalks. This is a very cute gesture for your kid. First of all let you child make foor impressions. Now cut a face and ears and the tummy of the bunny. Cover the face with the picture of your child and vover everything else with cotton with the help of your child. This will actively engage your child in the activity. Buy some lollypops and stick padded feet to the head of the lollypop. Add athermocol ball to the end of the lolly pop. Keep the lollypop inverted and then draw the eyes, ears and the nose of the bunny on the thermocol ball. 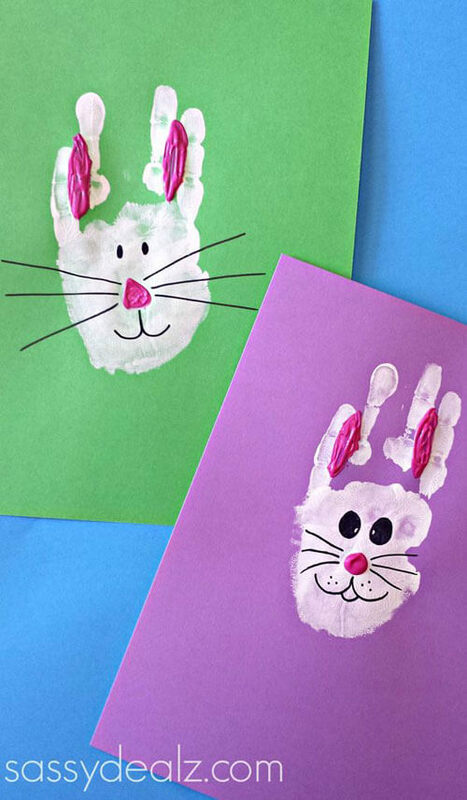 Add white pom poms as the hands of the bunny. Add a colourful ribbon at the neck of the bunny. First of all buy a lots of mini eggs. Now draw the shape of an egg on a coloured sheet of paper. Now start sticking these mini eggs filling up the drawn shape. You can either go line by line or just stick them on in a haphazard manner. This looks great when finished. Your kids can easily do this and will have finishing this DIY project. 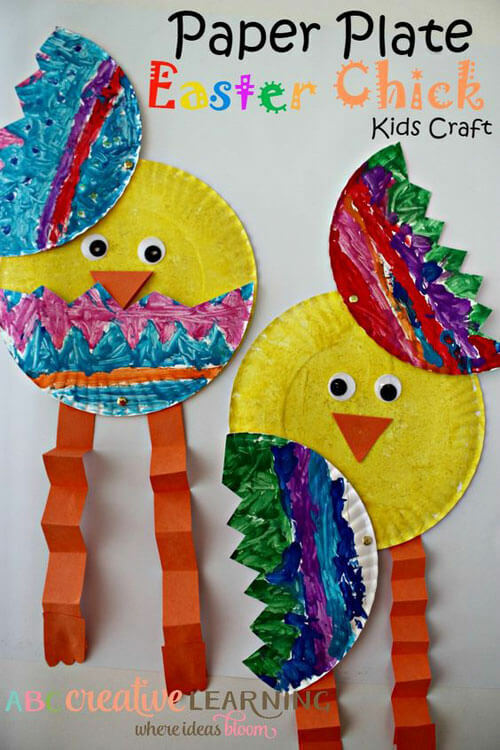 This Easter chick is easy to make and your children will love to make it. Get two paper plates. Cut one of the plates in a zig-zag pattern from the middle. 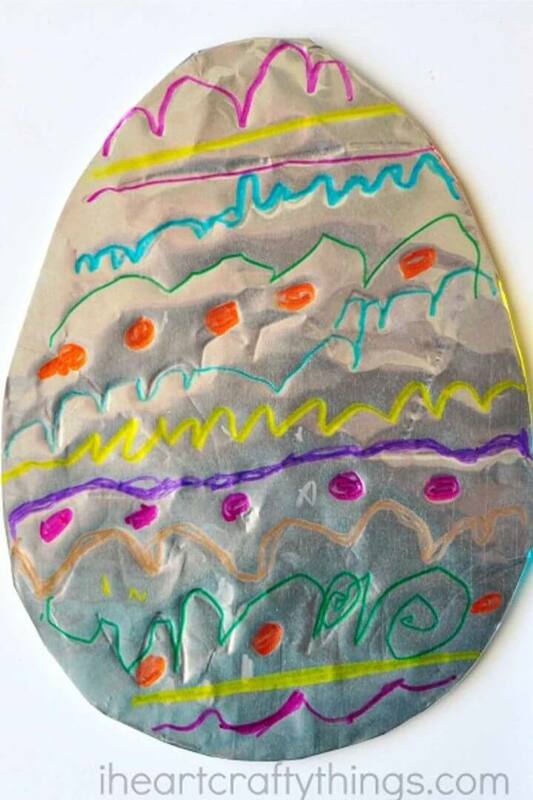 And let your child draw fancy patterns and the colour them on these two pieces of a paper plate. On the whole plate, paint it yellow. Add googly eyes to the yellow plate and a triangular orange nose. 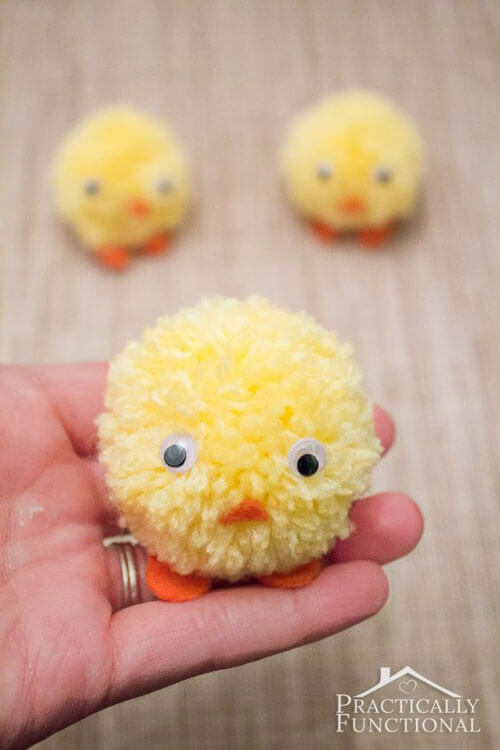 Now decorate the round yellow chick with the other two designer halves. 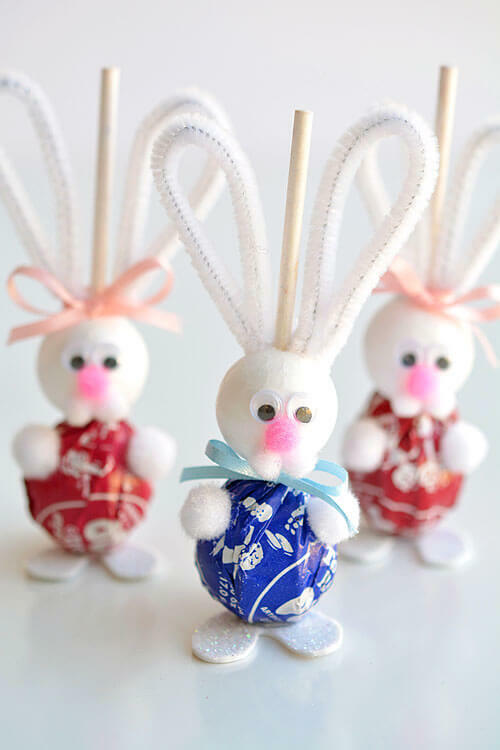 These bunnies are really easy and fun to make. First of all entwine a piece of pipe cleaner onto a cylindrical shape. Make an ‘M’ withthe other piece and slide the entwined piece onto the shape ‘M’. Finish it off with googly eyes and a small pom pom nose. Make a big yellow pom pom to start with. You can use any technique to make a pom pom. Trim the flyways to perfection. Now add google eyes to the yellow pom pom. Make orange felt feet for the chick and an orange felt nose. Take a trough and add lots of shaving cream to it. Now add colour to it. Spread the colour with a tootpick. 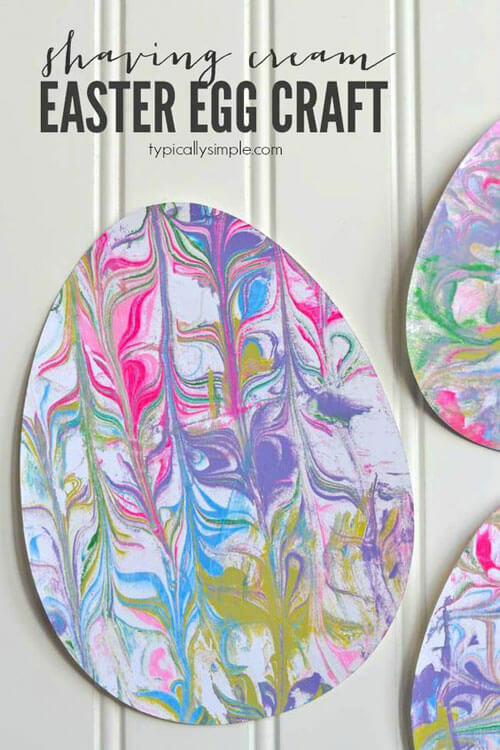 Now cut the stock card paper in egg shape and place the egg shapes on the shaving cream. Apply a small amount of pressure so that the sheet absorbs the paint. This is a very easy DIY. Take an old sock and fill it up with rice. Use a clear rubber band to seal the tummy of the rabbit. Now make the mouth of the bunny with more rice filled into the sock. Seal it with a clear rubber band. Now stick movable eyes to the face. Add nose and hunny teeth. Add a big pom pom to the back of the bunny. Cut the leftover socks in two to make the ears of the bunny. Tie a ribbon at the neck of the bunny. You have a playful bunny for the Easter. 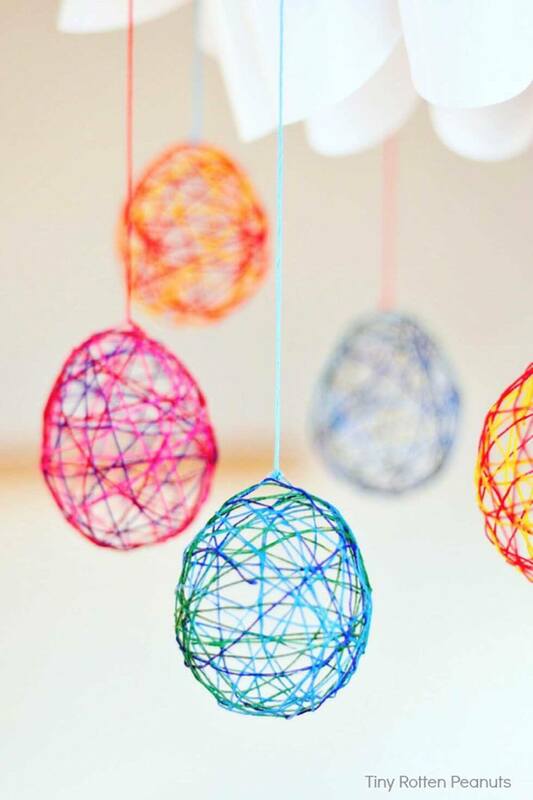 Take small balloons and cover them in woollen thread covered in glue. Stick this onto the balloon and wind the thread over and over again. Once you are happy with the windings, let it dry. After the glue has dried, pop the balloon and take the rubber of the balloon out. 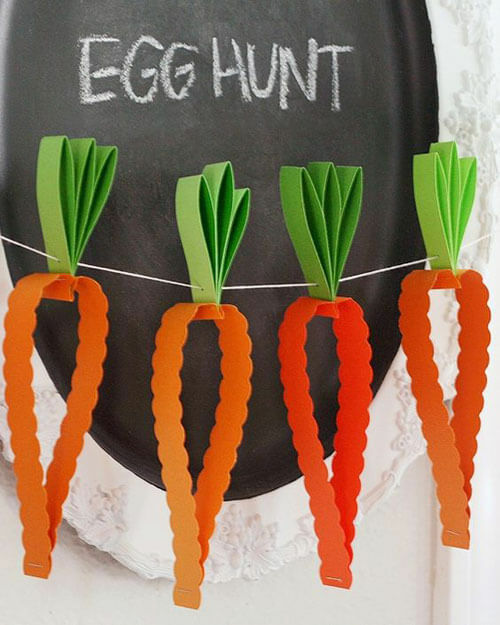 You have an easy to hang egg for th Easter. This is a very beautiful tin foil Easter egg. Your child can draw anything on this tin foil base. Look up the link for better understanding. Take a cardboard piece and cut it in the shape of an egg. Now starting from one end. Start winding the yarn onto this cardboard. You can add beads and sequins while winding the yarn. 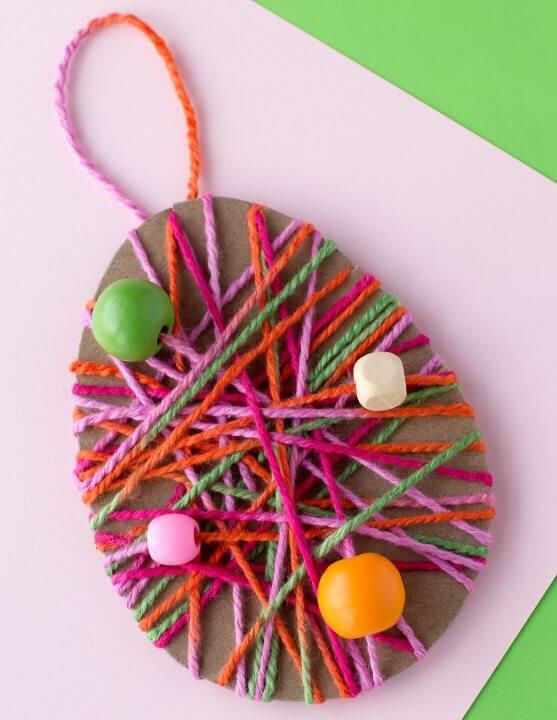 Leave a piece of yarn to hang this Easter Egg. Your child can easily make this DIY project. 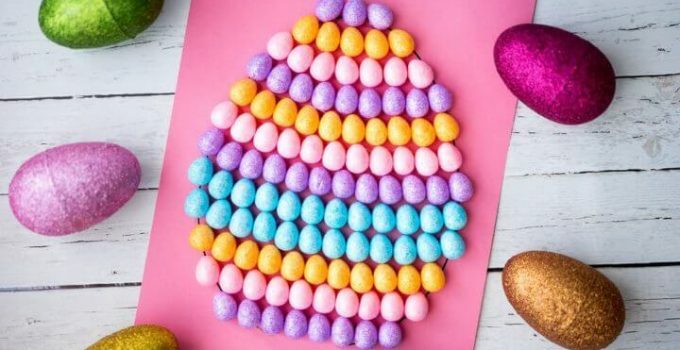 Hope you liked all these Easter DIY projects. 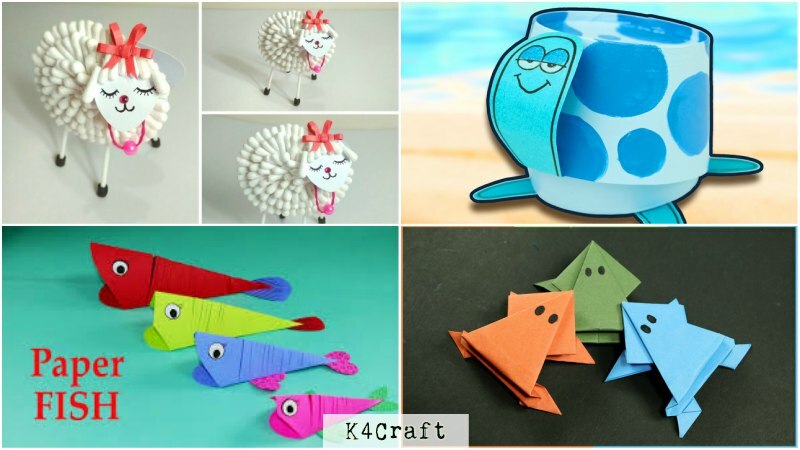 We wish your child has even more fun while making all of these. We will await your feedback in the comments section below. Have fun this Easter.